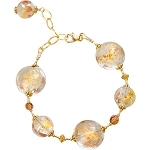 Rich 24kt Gold Foil authentic Murano Glass Beads are wire wrapped on Gold Plated Chain for a rich look with it's double strand and mix of shapes and sizes of Venetian Beads. A glass clasp finishes off the necklace. Handwrapped in the U.S.